11.7 teslas for understanding the human brain! It's a world premiere: the NeuroSpin centre at Saclay (France), dedicated to studying the functioning of the human brain using MRI, is aiming to possess an 11.7 T magnet by 2011. This is a major technological challenge that is mobilising the CEA's finest specialists in liaison with companies such as Siemens, Alstom… and Metrolab. Here's an update. A building covering 11,400 m2, initial investment of € 51M and an expected permanent workforce of 150 (as against 80 at the moment). Inaugurated in November 2006 at the French Atomic Energy Commission (CEA) site at Saclay, NeuroSpin is destined to become one of the world's foremost centres of research on the human brain. According to Denis Le Bihan, the initiator of the project and scientific director of NeuroSpin, its aim is to: "push back the existing limits of brain imaging using ultra-high field nuclear magnetic resonance ". 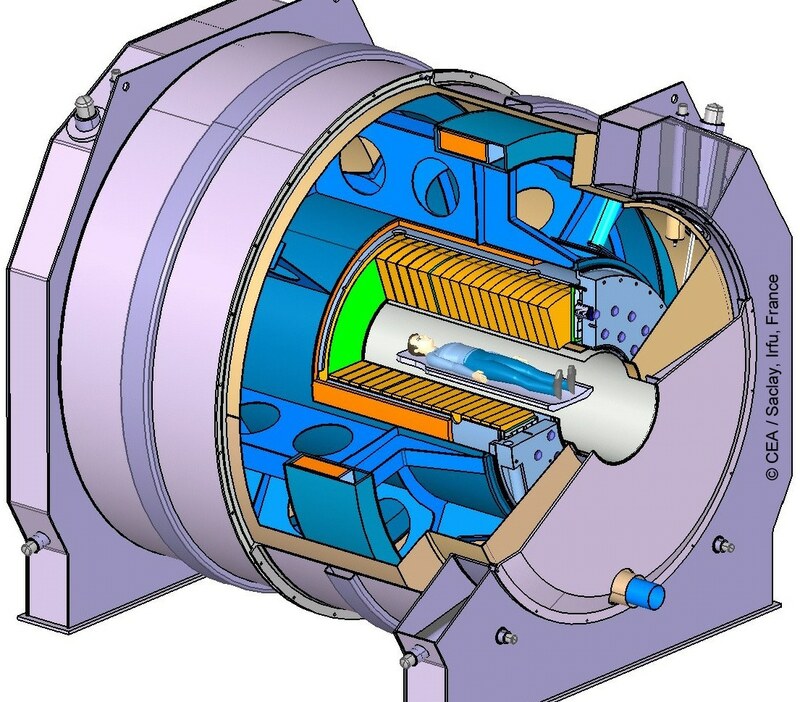 The centre already has a "standard" 3 T MRI magnet and one of only 30 "whole body" magnets in the world generating a field of 7 T. It will also be equipped by autumn 2007 with a 17 T magnet with an inner diameter of 26 cm, to be used for studies on animals. "These leading-edge facilities", stresses Denis Le Bihan, "are already opening up broad prospects for using functional MRI and diffusion MRI techniques in psychiatry, cognitive neurosciences and medicine" (find out more). But NeuroSpin will be going even (much) further, in acquiring the world's first 11.75 T magnet intended for studies on humans by 2011. In MRI, intense field means high resolutionResolution measures the ability of a magnetometer to distinguish ("resolve") two nearly identical field values. Related to precision, but not to...:"With an 11.75 T field, which corresponds to a proton resonance frequency of 500 MHz, we will obtain accurate images of as little as a tenth of a millimetre, that is to say the size of a group of neurons! ", boasts Denis Le Bihan. Clearly, the scientific challenges connected with obtaining this magnet are in keeping with the hopes it raises. CEA Saclay is responsible for the design and construction, under the direction of Pierre Védrine of the DAPNIA*. "Our teams have been working on this project for several years now and the main design options have been validated", says Pierre, adding: "We are going to be using technologies that no-one has ever used before." Does that surprise you? The first difficulty: "At 11.75 T we are reaching the physical limit at which it is possible to use niobium-titanium alloy, the best superconductor for this type of coil",summarises Pierre Védrine. Which means, in particular, that it is necessary to replace simple helium with superfluid helium to cool the material and obtain a cryostable magnet. The second difficulty, and a "sizable" one at that: the dimensions of the magnet. For an inner diameter of 90 cm you can reckon to use no less than 100 tonnes of equipment, including 60 just for the superconductor – i.e. 136 km of multifilament carrying a current of 1,500 A. This is a real brain-teaser in terms of electromagnetic constraints, electrical regulationA NMR-regulated magnet is an electromagnet whose field is measured by an NMR teslameter, which then closes the loop by... and stored energy (over 300 MJ). In designing such a winding, it was necessary to perform extremely complex calculations in order to comply with the draconian requirements concerning the spatial homogeneity (10-10) and temporal stability (10-10) of the main field: "We ruled out the classical solenoid-type windings in favour of a geometry consisting of 186 double pancakes", indicates Guy Aubert, one of the world's leading experts in intense magnetic fields, who advises the DAPNIA. The team opted for an antagonistic coil system for reducing the fringe fieldThe field around a magnet, not in the gap or bore....: "The passive method would have called for about 1,000 tonnes of iron", estimates Guy Aubert. The CEA commissioned Alstom to construct this high-precision winding. Two prototypes are currently under construction, one to test the homogeneity of the field generated by a "scale model" of 24 double pancakes and the other to study the stabilization over time of a magnet permanently connected to its power supply. As for the gradientIn this context, gradient refers to the spatial variation of the magnetic field.... coils, they have been ordered from Siemens. They need to take into account the very high mechanical forces that will be exerted on the windings while keeping the amount of noise generated to the minimum – though this should not drop below 120 dB! * DAPNIA, the Department of Astrophysics, Nuclear Physics and Associated Instrumentation at Saclay, was responsible in particular for designing the two largest superconductor magnets at CERN (Atlas and CMS) and the 400 quadripole magnets of the Large Hadron Collider (LHC).